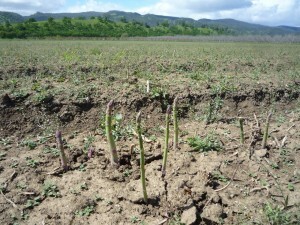 Green asparagus, white asparagus, purple asparagus…. Asparagus arrives quickly to markets in spring, and it can grow really quickly too. Up to 7 inches a day when temperatures are 90 degrees! It’s said you can lie on the ground and watch it grow! I’ve never done that, but I have fond memories of a great place for hide and seek in my dad’s fern-like forest of asparagus plants gone to seed after the harvest in his vegetable garden. 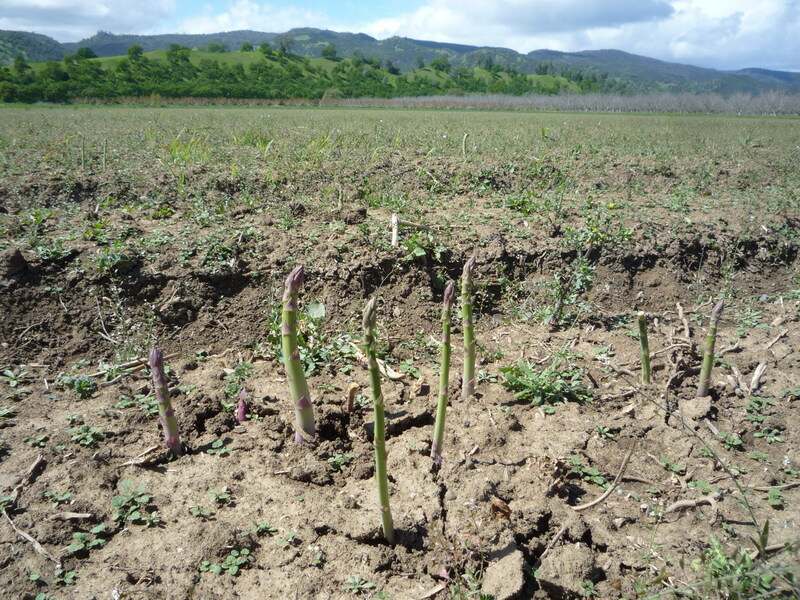 Asparagus is a perennial, it takes 3 years to produce the first crop, and will produce for 10-15 years. California grows 80% of the domestic crop, with Washington and Michigan providing most of the remainder. Purple asparagus is sweeter and higher in sugar than its cousins, and contains cancer fighting phytochemicals called anthocyanins responsible for the purple hue. White asparagus is green asparagus minus the sun – dirt mounded over the growing asparagus shoots prevents chlorophyll development – which slightly reduces the nutritional value but makes delicately flavored spears. 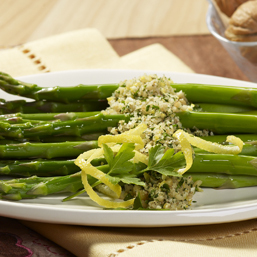 One of my favorite ways to serve asparagus is with a light topping of Walnut Gremolata. Gremolata [greh-moh-LAH-tah] is finely chopped parsley, garlic and lemon zest, typically served over veal, lamb, or fish. For the California Walnut Commission I created a nutty variation which adds a dose of omega 3’s to this zesty topping. Try it over grilled zucchini or steamed broccoli too! Preheat oven to 350°F. Finely chop walnuts to the size of rice grains, to make about 1/3 cup. Place on a dry baking sheet. Bake 5-10 minutes until lightly toasted, stirring once or twice. Cool. While walnuts are toasting, rinse asparagus and snap tough ends off just where the spear yields to bending. Place spears in a wide skillet. Add cold water to nearly cover. Bring to a boil over high heat. Simmer uncovered 3-5 minutes, turning several times until asparagus is just barely tender. Drain and immediately rinse with cold water. My favorite way to quick-chill veggies is a tip I learned from Rita. She calls it “kill the cook”. Drain the hot water and immediately add several cupfuls of ice cubes right on top of the veggies in the pan. Place pan in sink and fill with cold tap water. When the ice cubes have melted the asparagus will be chilled. Drain. Rinse parsley and pat dry between sheets of paper towel. Finely chop to measure 1/4 cup. Place in a small bowl. Remove yellow part of lemon zest with a vegetable peeler; finely mince with a sharp knife. (Or use a grater, but I like the coarser bits of zest). Add zest to parsley. Stir in cooled walnuts, garlic, salt, and pepper to taste. Arrange asparagus on four salad plates and top with gremolata. This is how to chop the parsley, lemon zest, and walnuts. Areta, this recipe IS delicious. Rosemary is a walnut expert of sorts, having developed recipes for the Walnut Board for years. Wanted to try out the Asparagus with Walnut Gremolata recipe recently, but ended up with unexpected guests and needed to stretch it somehow. Here’s what I did: Cut the asparagus diagonally into 1 or 1.5 inch pieces and steamed them. Mixed in some rotelli (about 50/50 ratio, didn’t want to overshadow the asparagus). Put the gremolata in the food processor and thinned it a little bit with olive oil and a tiny bit of lemon juice (so as not to overshadow the zest), then tossed with the pasta/asparagus. Very yummy and enough for a side dish for the whole group! Thanks for the delicious recipe. Love your adaption Areta! You made the gremolata into pesto and it sounds wonderful. I can just taste/see it!